"One of the most commonly used behavior management interventions, especially in settings for students who have learning or behavioral challenges" (McIntyre, 2014). Definition/Description: The way this strategy is usually used is to give students a token for good behavior. The student(s) work toward a reward in which you or they have already chosen. If they do something good or complete homework or whatever the criteria is, then they receive a token. When they reach the number of tokens needed for their reward then they get whatever it is. However a way I would modify this to fit for my student who misuse certain things, such as the bathroom, would be to give them three tokens a day to use. 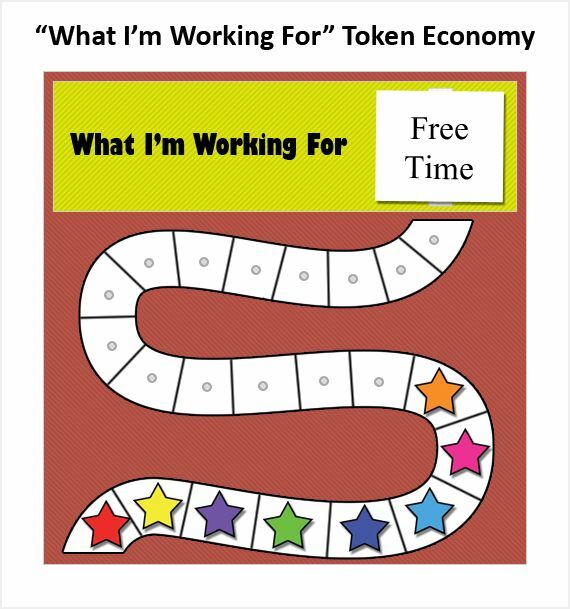 The Token Economy is a great strategy to share with parents who have children with Autism or behavior issues, because it can help manage their behavior at school as well as at home. There can be a share responsibility and standard for both places. This video shows how to do a token system at home, but also for teacher at school. For My Individual Student: MODIFY! I have a student who is identified as EBD and she often misuses the bathroom. I was taking to my mother, who is a special education teacher, and she said to use a token system with her. Everyday she gets three tokens on her desk, if she wants to go to the bathroom or get a drink she has to use one of her tokens. This allows her to visual see how many times she can use the bathroom or get a drink before there are no more. This way she is not just leaving the classroom to leave, but she is responsible for choosing when she wants to. This is how I would modify this specific strategy to fit the needs of my individual student in my class. This strategy can be related to real world situation, just like the picture at the top shows comparison between school and students and jobs and the real world. ​Token economies are based on operant learning theory, which states that rewards and punishments shape behavior (Gunning, 2012). A token economy rewards good behavior with tokens that can be exchanged for something desired. A token can be a chip, coin, star, sticker, or something that can be exchanged for what the student wants to buy. The token system and the token economy are good for students with Emotional Disturbance, Autism, as well as whole class. Students who exhibit behavioral problems often need reinforcement and a motive to do their work, be nice to others, and follow behaviors (Hallahan, Kauffman, and Pullen, 2015). Using one example of a token system will allow all student or those student with behavior issues to work towards something they like and have a reason to do well in school or communicate nicely with others. "A balance of behavioral control and academic instruction is required..."(Hallahan, Kauffman, and Pullen, 2015). Using a token system allows teachers to easily manage the balance between both, because they could get a token for work or they could get a token for behavior. It is a easy way to allow the student to work on all areas that he or she needs too. 2. Make a reinforcement inventory to determine the rewards desired by your students. Use open-ended sentences (e.g., "If I had 15 minutes of free time, I would like to...") and choices (e.g., "Given free time, which would you rather do? (a) talk with a friend; (b) play a game; (c) read; (d) listen to music). List only those choices that you would allow in your classroom. 3. Complete steps 1 through 9 in the above section titled How to Use Token Economies/Point Systems. Make all the materials and indicate which items you would use for tokens and back-up reinforcers. Write your spoken introduction of the system to the students. 4. With another person, role play the introduction to the youngsters regarding the new program. 5. A parent feels that your token economy is bribery. How do you respond to this parent? 6. Hamilton comes to you to report that someone stole his tokens. How can you prevent theft from occurring in the future? 7. You caught Jeff bringing poker chips from home that look like the ones you use to reinforce students. You had this problem once before when you gave check marks and the students made their own. How can you prevent this behavior? 8. Is it fair to take away tokens that have already been earned by the student? Shouldn't s/he be able to keep tokens s/he has earned previously by displaying appropriate behavior?" (McIntyre, 2014). 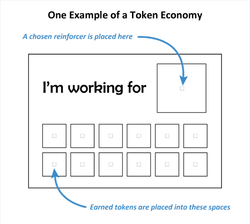 Example of how to implement the Token Economy in the classroom. The teacher demonstrates it with one students. Since this is a behavioral strategy it can be used in all content areas and students can work towards receiving the tokens throughout all content areas. It can be used individual, small groups, or as a whole class. Above are template Examples teacher can use for the Token Systems. Gunning, T. G. (2012). Creating literacy instruction for all children in grades pre-K to 4. 2nd Edition. Boston: A and B.